The foyer of the hotel is large and airy. There is the warm diffused lighting of opulence and old money. The ceiling above the front desk is adorned with a fresco in muted colors and it towers two stories above the few people in the lobby below. The floor is made of smooth gray marble, it shines in the warmth of the lighting and echoes as women in high heel shoes take small dainty steps across its surface. In the center of the foyer, an overabundant bouquet of rainbow colored flowers soak up water in a glass vase upon a circular wooden table. Off to the side of the lobby, in the corner and somewhat hidden by the diffused lighting and shadows is a shoe shining station. There are no walls separating it from the larger lobby, but there are some green trees in large blue glazed pots that are lined up in a row parallel to the beige wall of the hotel. The trees create a small living divide from the main foyer and also provide a hint of privacy. On one side of the small space is a cluster of fabric covered chairs, the kind popular in a doctor’s office. No one fills the seats. No one flips through the magazines that lay on the end table. The station is empty and quiet. The hunter’s green carpet that covers the small space is clean and the parallel lines of a vacuum cleaner are still visible across its uniform surface. In the center of the square shoe shining area is a pit, a large hallowed out space in the smooth shape of a bowl. The edges slope down gently from the edges of the carpet. The inner surface of the bowl matches the color of the hotel wall in the same beige shade. The sculpted hole has light streaks of black and brown, remains from the many shoes that have been shined upon its surface. Standing at full attention just a centimeter from the wall, is a woman wearing a gleaming white shirt covered in a crisp black vest and ironed black pants. She looks like a blackjack dealer. She is waiting, her hands are clasped together behind her back, there is no smile on her face, she stares ahead calm and serene, waiting for the next customer to sign in on the small registration sheet and step into the hallowed pit for a thorough shining. 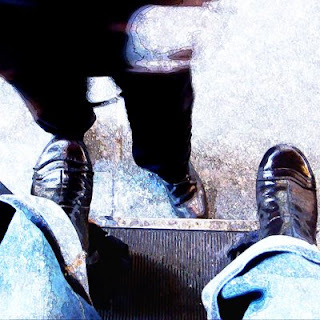 Another woman stands a couple feet away from the shoe shiner, also wearing the same black and white uniform. Neither of them talk, they stare straight ahead, their legs slightly apart, their light brown skin glowing softly in the diffused light .